The County's Agricultural Commissioner has a free identification service. Samples are being sent up to Sacramento for identification. Once the disease or pest is identified you will receive a letter in the mail. There are no call backs. UC IPM Website provides information about pest identification and management. You can select your plant and see a list of all possible problems that can affect your plant. There are photos to help you narrow down your search. Visit the Pest Note Index if you know the name of your pest. UC also has resources about Invasive and Exotic Pests. Asian Citrus Psyllid - This pest is responsible for spreading HLB, or citrus greening disease. Shot Hole Borers - These tiny beetles spread Fusrium fungus in many species of trees. Chilli Thrips feed not only on peppers and other vegetables, but also on roses. 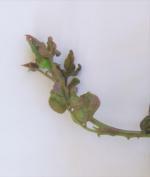 Rose damage is characterized by small, misshapen leaves and tiny buds. Mosquitoes are not plant pests, but human pests that we encounter while working in our gardens and even indoors.